I think it's a pity she grew out of this phase. Also, on a completely different topic, what do you all think of this nightie? Shareable? Yeah, I would have to agree, Dina is very adorkable! I think she could even sell makeup to me! No way!! I never would have guessed! LOL, and just look at her now! Well then, she shouldn't be so hard on Lilith... Phases indeed, she's one to talk! Gosh, I'm giggling too! I would have never guessed that was Mary Sue. I love that nightie too! Mary Sue, you look so different! Also, I love the nightie. Also, the nightie is really beautiful! Yeah, the childhood thing with the Mary Sue - Cassandra friendship throws me off a little. I can easily see adult Cassandra being friends with a much older woman (I, for example, am just shy of 30, and have friends who are 50+), but if you want to be really true to the game details, it didn't happen that way. The babysitter thing works, or even just that they live next door to each other and little Cassy liked to wander into the Pleasant's (or the Oldie's, take your pick) backyard and was interested in Mary Sue's pottery. I like your vision of the Goths as nonconformists. It's fun, and it really makes sense if you're linking it to Sims 3, where they seem like emo rockers. 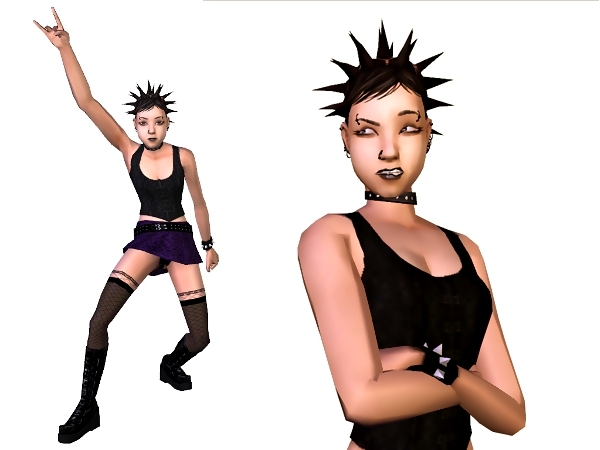 The Goths as emo rockers is one thing I actually liked about TS3. I mean, sure it may not fit with Cornelia's original characterization but you gotta love the purple hair! Purple hair is fun, for sure. I'm not familiar with Cornelia's characterization in Sims 2. Does she even have a story around her at all? I never looked into it. "Cornelia is the founder of the Sim City Bridge Society and enjoys high tea and phrenology. She is thankful to have her granddaughter, Cassandra, so nearby." The phrenology thing is a little eccentric, but she certainly wasn't quite so literally "Goth". Though a purple haired old lady character would have been fun.